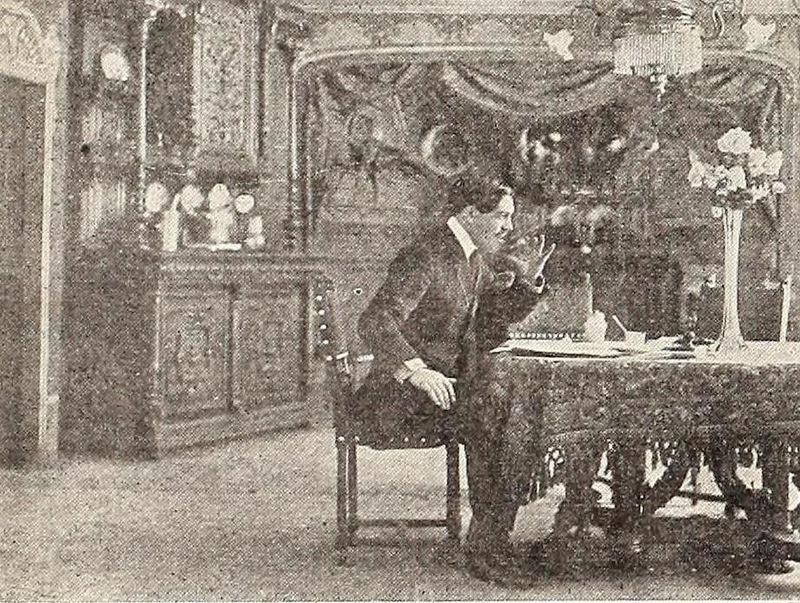 Carl H. Claudy, a writer with The Moving Picture World, expressed open disgust of foreign comedies in a 1911 article, "Foibles of the Photoplay." Claudy said that the films of André Deed showed no "standard or class." He described the work of Marcel Perez as "slush." He was particularly upset by a recent Perez comedy called Tweedledum's April Fool Joke (originally released in Italy as Pesce d'aprile di Robinet). He accused the film of being "horse play of the childish order." 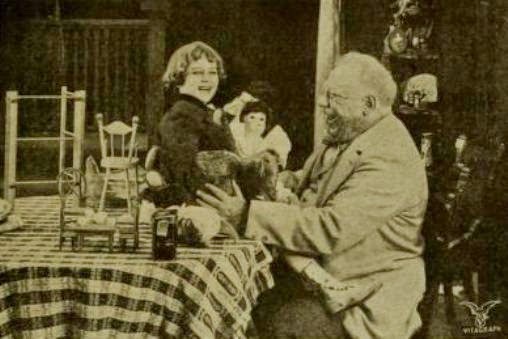 In the film, Perez plays a do-nothing son. His father becomes so resentful of the young man that he cuts off his funds and kicks him out of the house. Out of spite, the son places an ad in the local newspaper to notify the public that his father will provide food and shelter to vagrants. This, of course, causes vagrants to swarm to his parents' home. 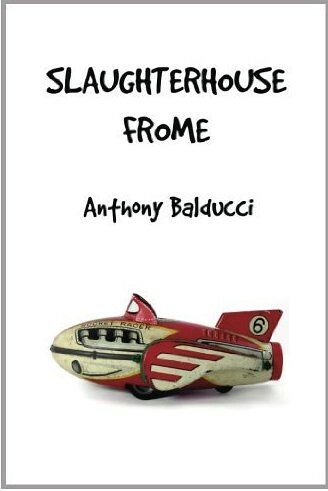 "So," wrote Claudy, "[paupers] ransack the house, tear it to pieces, [and] get gloriously drunk." In the final moments of the film, Perez strolls into the home with a sign that reads "April Fool." He is joined by his parents and the vagrants in a hearty laugh. The film ends. It undoubtedly rankled Claudy that the main character of the film was a "very devil of a fellow," but the critic expressed even greater dissatisfaction over the unbelievability of the plot. Claudy, who had worked for newspapers, couldn't imagine an editor printing an ad that summoned the community's poor to a soiree at a private residence. He also had to shake his head in disbelief to see the parents laughing hilariously after their home has been destroyed. Claudy asserted that, compared to foreign film producers, American film producers possessed humor and wit on "a far higher plane." 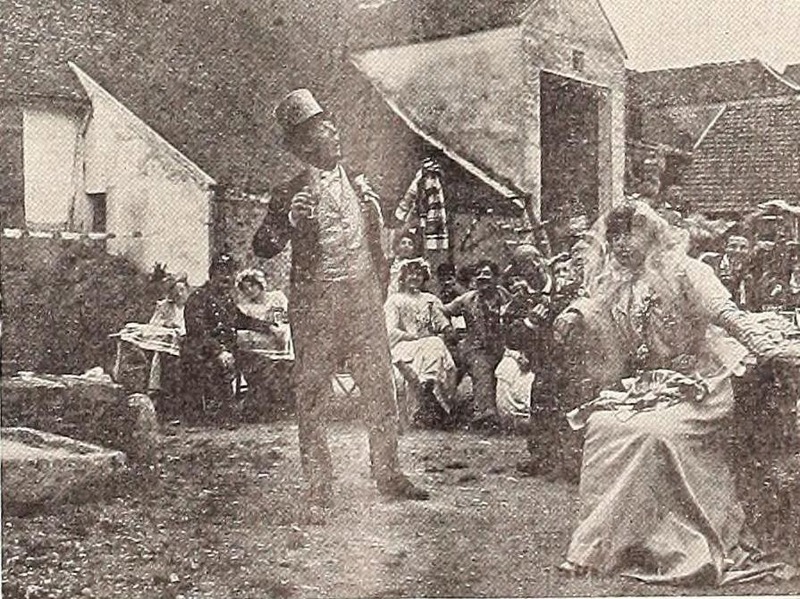 He offered as proof a recent Edison comedy called Department Store (1911), which featured a sympathetic character and a realistic situation. He said that the audience "laughed, applauded and understood." He maintained that the worst American comedies (specifically, Essanay's "Hank and Lank" series) were a "few degrees" better than the best foreign comedies. A fair-minded person could not possibly consider Hank and Lank less devilish than Perez's waggish son. 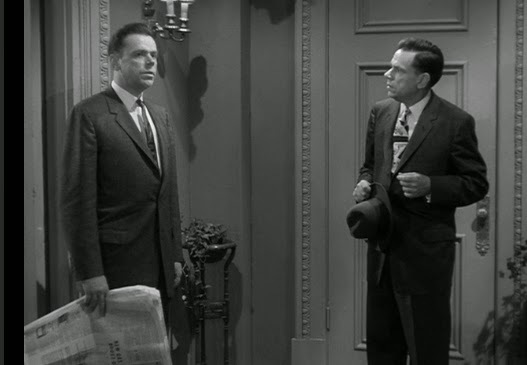 Hank and Lank, as played by Victor Potel and Augustus Carney, are lazy tramps forever on the lookout for a scheme to cheat people out of money. 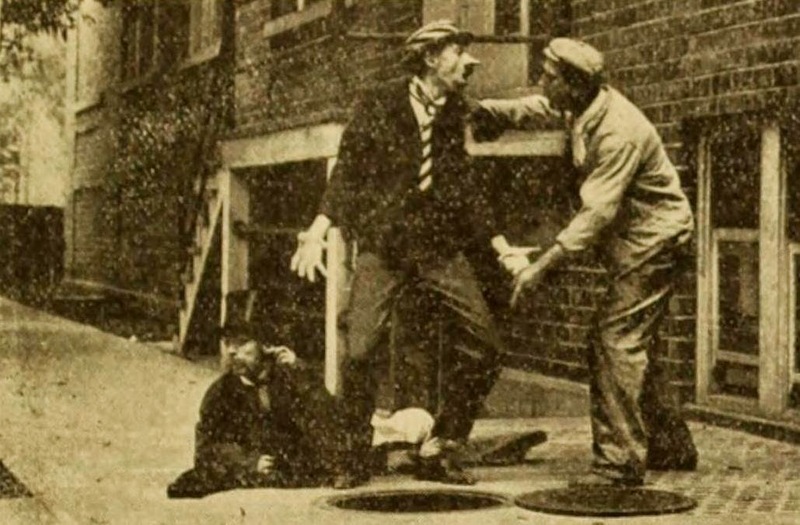 This is a still from They Dude Up Some (1910), in which the tramps pretend to fall down an open manhole so that they can collect payment for their scrapes and bruises. 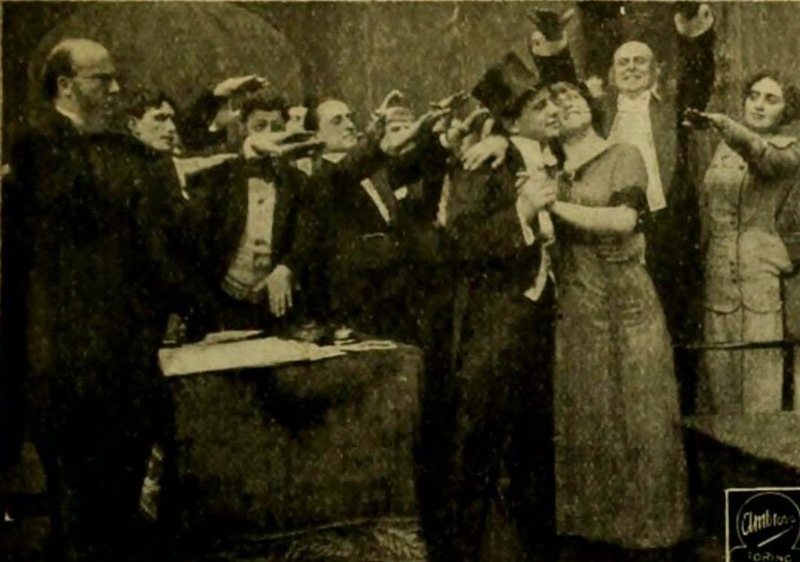 In Blind Men (1910), the tramps pretend to be blind as a way to solicit public charity. 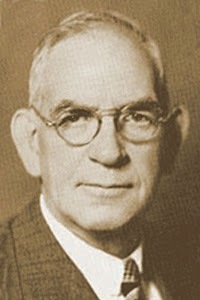 The series producer, G. M. Anderson, assured exhibitors from the start that the series would be wholesome fare. 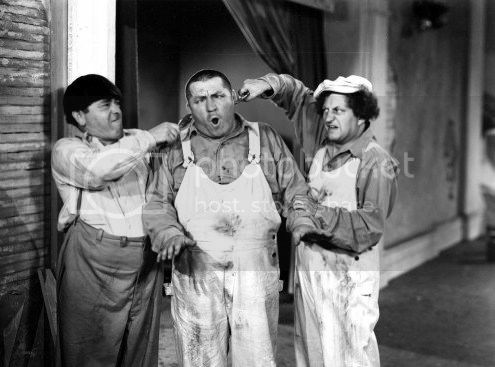 He said, "[G]reat care will be exercised to keep the exaction of the story away from the slapstick variety of comedy. 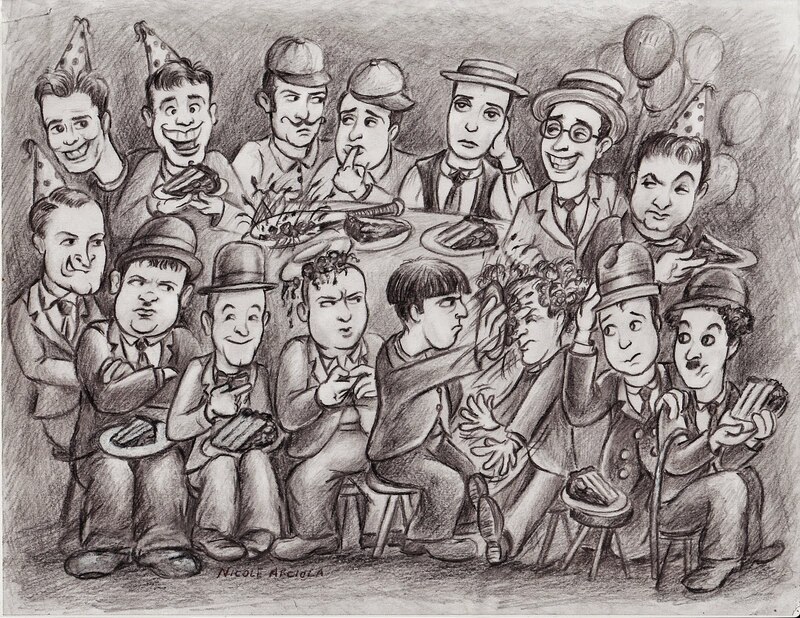 Each story of the escapades of Hank and Lank will be legitimate in its way, and the producing of each will aim at giving point to the humor of a situation without resorting to horseplay or vulgarity." So, maybe, the absence of violence and adultery is all that it takes to make a comedy wholesome. Other American critics shared Claudy's view, reacting more kindly to the gentle, relatable work of Vitagraph's John Bunny than the wild and far out comedy that was imported from Europe. 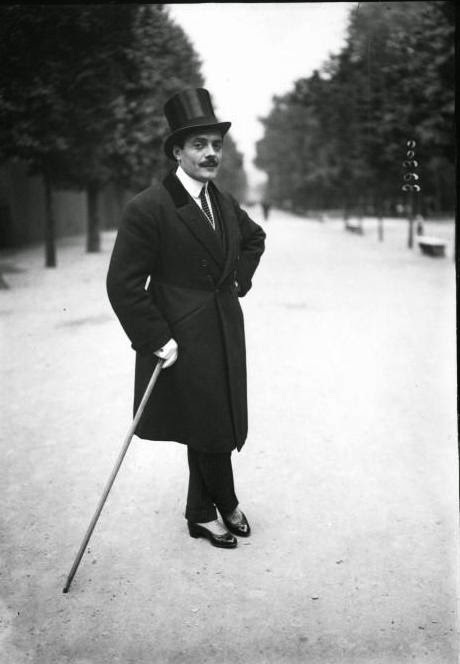 It is hard to imagine that someone could be offended by one of Max Linder's boulevard farces. 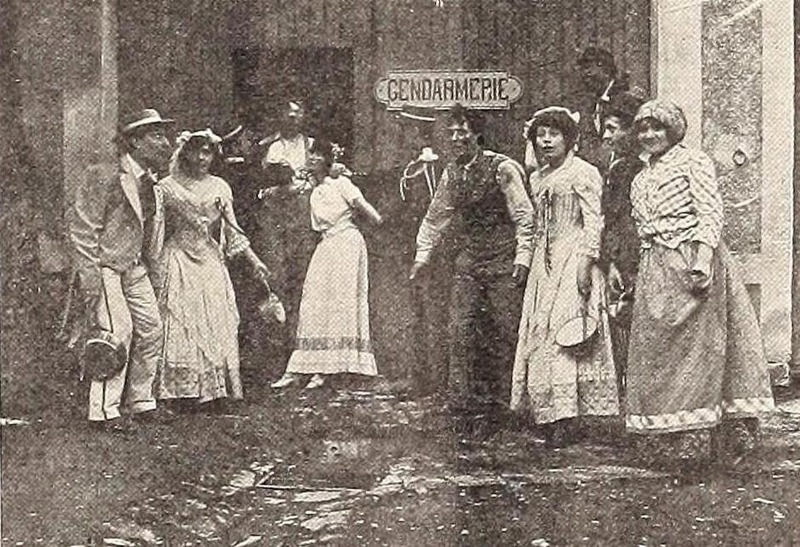 But let's look at the opening scene from the 1910 comedy Max is Absent Minded (released in France as Max est distrait). The scene introduces Max at breakfast. Because he is preoccupied reading a newspaper, he pours coffee into his top hat. It is a simple gag. 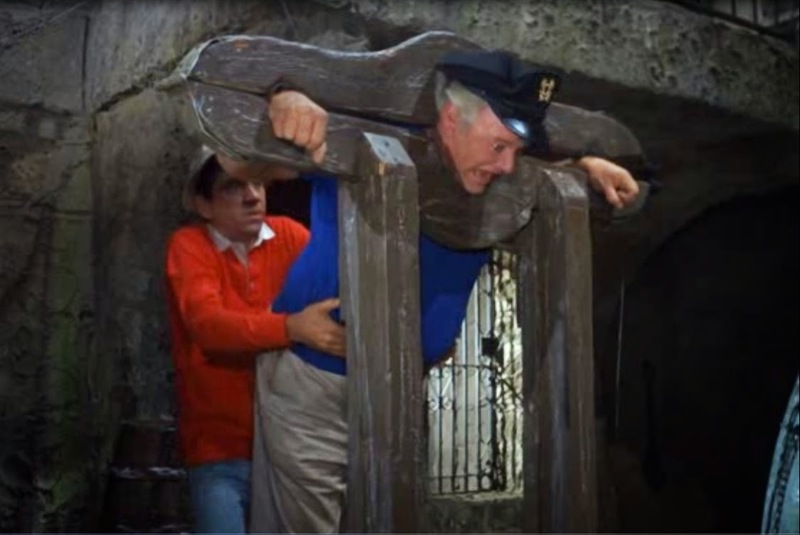 It is a gag that likely made viewers laugh. But a Chicago-based critic for The Nickelodeon wrote, "Max is a bit disgusting in this film, where he pours coffee into his silk hat and then drinks it." Presumably, it was the fact that Max drank the milk that pushed the critic over the edge. 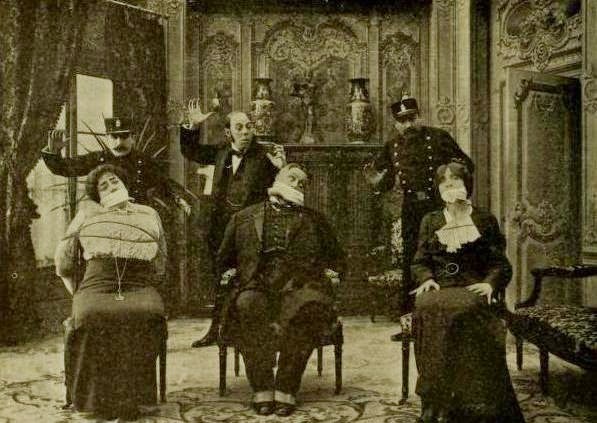 A 1910 Gaumont comedy, A Dummy in Disguise, also offended a critic of The Nickelodeon. The critic complained, "[T]he piece drops to the level of helter-skelter farce, with everybody hitting somebody else; and the final picture is one of those inexcusable bits of vulgarity, where an enlarged head is thrown upon the scene, the actor twitching and mouthing, and screwing up his face in an effort to be comical. Why do the French, who are the very soul of wit, allow such disgusting horse-play?" This could have largely been a case of national loyalty. It would make sense in this context for a critic to favor homegrown product and hold resentment for foreign product that had dominated the market for years. 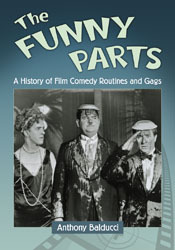 American film companies sporadically produced comedies during the early years of film production. 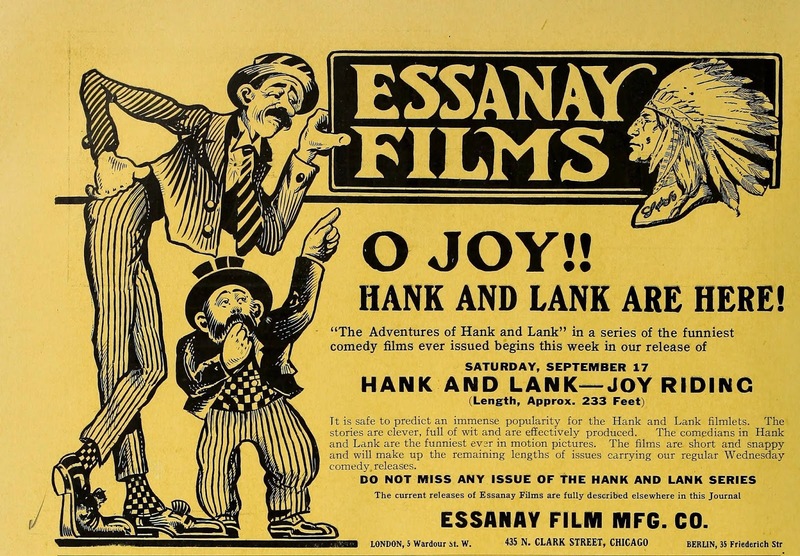 Essanay finally established a permanent comedy unit in 1907. Other companies eventually followed their example - Biograph and Vitagraph in 1909, Edison in 1910, and Kalem in 1912. 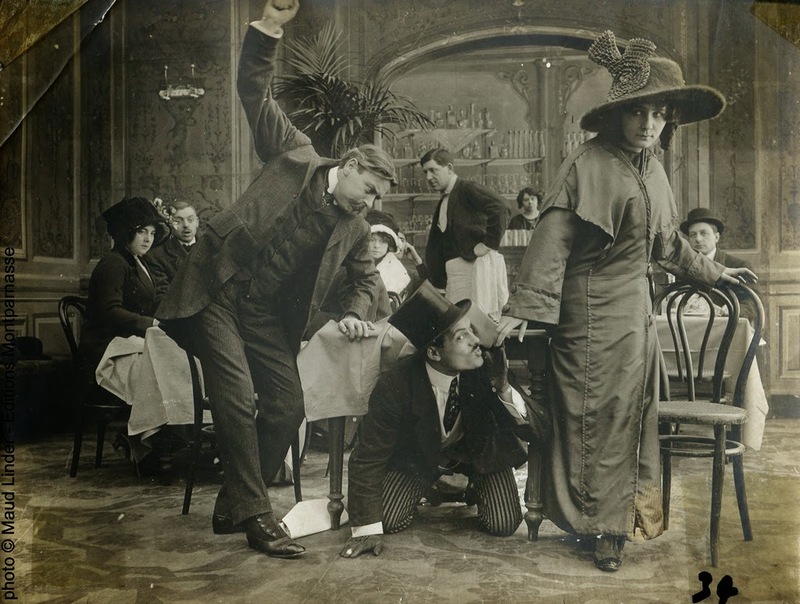 Before 1909, the demand for comedy in the marketplace was mostly satisfied by European companies, including Gaumont, Williamson Kinematograph, Pathé Frères, George Albert Smith Films, Lumière, Robert W. Paul, Hepworth, Warwick, Lux, Itala, Aquila and Ambrosio. Claudy cannot be faulted for preferring likeable protagonists. 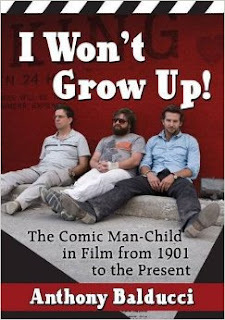 I, myself, get little pleasure from the comedy anti-heroes that populate films and television series today. It can make a film more satisfying when a character responds to a dilemma with genuine emotion rather than mass destruction. I also complain often about the overuse of CGI, which is often more important today than characters and story. 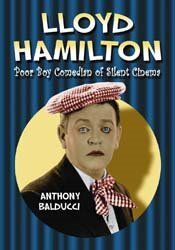 But silent film comedy was artful in its wild, fantastic and often destructive action. American film comedy would have never risen to its great heights if it had never broken free of John Bunny's drawing room. Another critic with The Moving Picture World half-heartedly defended Deed's films, which were known in America as the "Foolshead" comedies. He wrote, "It may be that all sorts of faults can be pointed out in these 'Foolshead' films. Their improbability and impossibility being the most important, but the average audience seems to accept them as they come. The films are enjoyed and apparently the more absurd the performances the more the audience likes the pictures. It would be difficult to say anything else. It is scarcely right to commend these films, as they violate even common sense. The fact remains, nevertheless, that they are popular and that the average audience will applaud them and ask for more." In Foolshead Swallows a Crab (1909), Deed finds after he has eaten a crab that he is behaving much like a crab. At one point, he walks backwards. Is that believable? Does it cause me to feel empathy? No, but I can say that it makes me laugh. 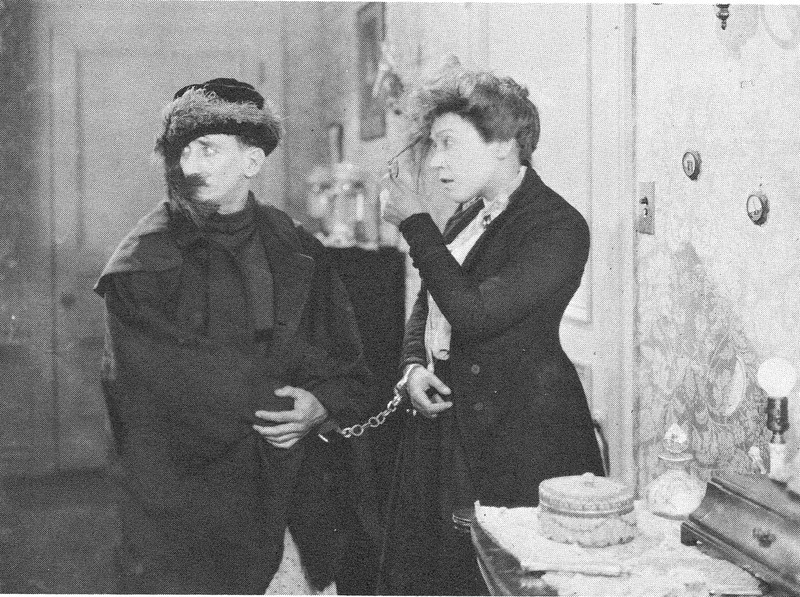 André Deed is tossed out of a hotel room in A Lodging for the Night (1913). Department Store, which involved department store workers who come together to help a co-worker who has been robbed, may have been a touching film, but the same story could have easily been enacted on a theatre stage. Deed and Perez provided impossible dreamlike visions that you could never see in a live theatre show. Little did Claudy know that American comedy was soon to be coarsened by the Keystone studio, which would create a sensation the following year. 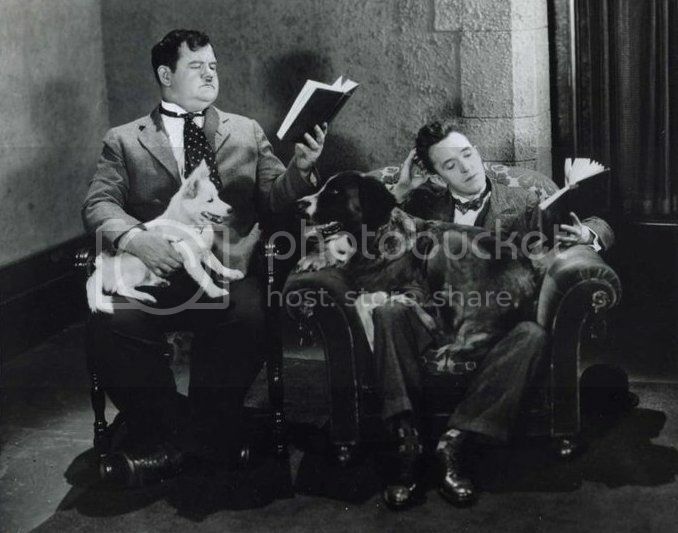 He would one day get to enjoy the tender and sympathetic comedy of Charlie Chaplin and Harold Lloyd, but he would first have to endure years of low comedy from Ford Sterling, Chester Conklin and Mack Swain. Claudy later achieved success as a science fiction writer, often depicting wholesome American astronauts battling ugly space aliens. If he expected his readers to suspend their disbelief about invisible beings from Venus prowling the Earth, then he could suspend disbelief about Perez's surreal antics. 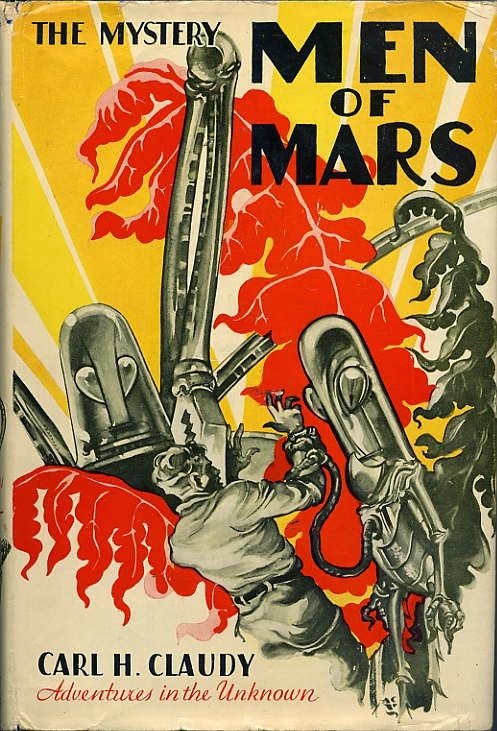 The back cover for Claudy's The Mystery Men of Mars features, in bold letters, a forthright expression of disbelief - "Can Such Things Be?" The European comedies of this early period were wonderfully creative and absurd. Such things could exist through a writer's imagination, an actor's expressions, and a technical crew's ingenuity. Welcome to the cinema of the fantastic. 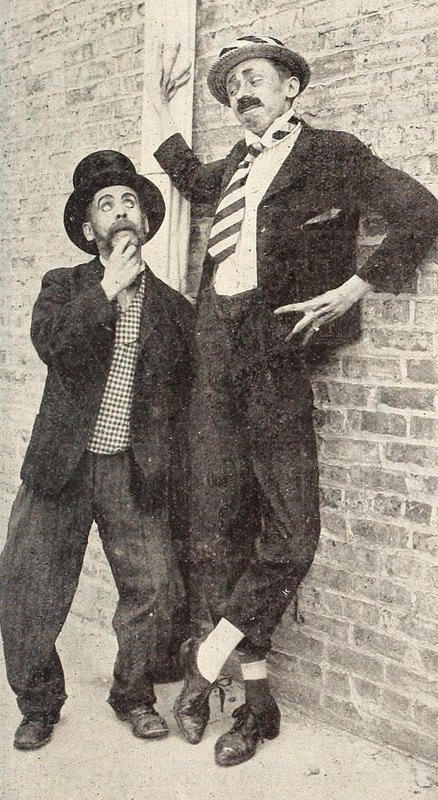 You can read more about Deed, Perez and Linder in my book, Eighteen Comedians of Silent Film. Claudy, C. H. "Foibles of the Photoplay." 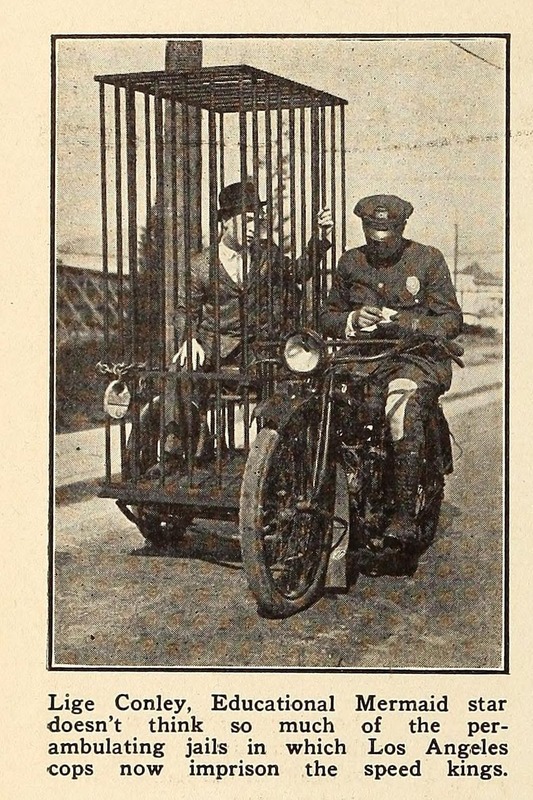 The Moving Picture World, Volume 8, Number 20, (May 20, 1911). 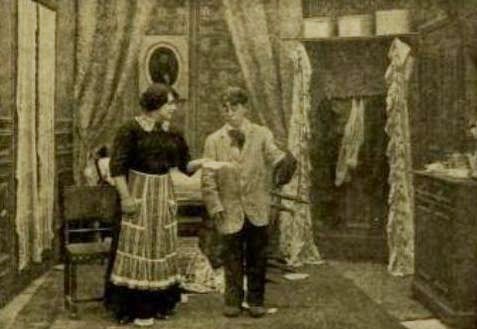 The Nickelodeon (October 1, 1910). p. 200-201. My favorite resource for information on silent films is The Moving Picture World. The other day, I was skimming through early issues of the magazine when I came across reviews and summaries for the pioneering work of a talented newcomer named Max Linder. Now, I need to point out that Linder's name was not emblazoned in ad leaders or noted in bold typeface in review headlines. It was standard practice at the time for a film actor to go uncredited for his efforts. This meant that the magazine's writers never knew Linder by name. A critic who wished to praise Linder for his performance could only refer to him as "the Pathé comic" or "the Pathé funny man." By 1910, this would change. Evidence of the change can be found in an issue of Variety dated June 1, 1910. A columnist for Variety's London Notes reported, "[S]everal of the London picture places are advertising certain pictures with the names of the players." As incredible as this may seem now, this was major news at the time. 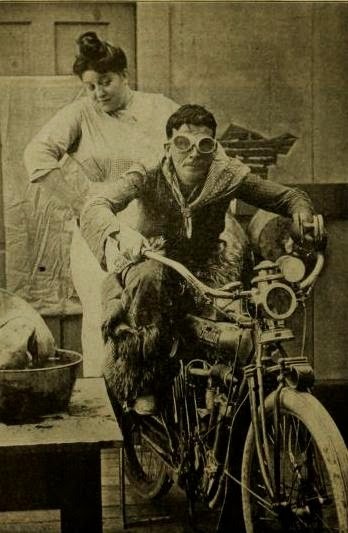 The writer specifically noted that Linder, "probably the best known of the picture actors," was one of the actors receiving star billing at these theaters. Of course, it could be wrong to assume that a person today would be astounded to see a movie poster without the stars' names prominently featured. 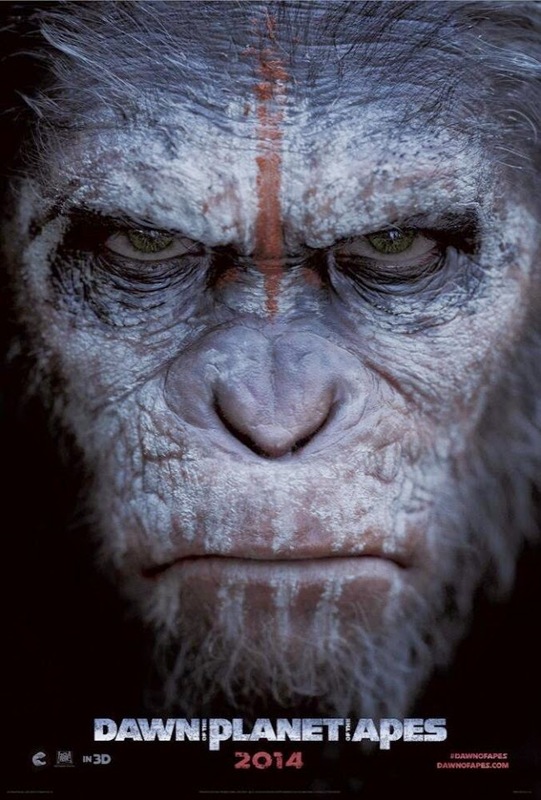 CGI spectacles have replaced movie star vehicles, which means that actor names are barely visible in many of today's movie posters. 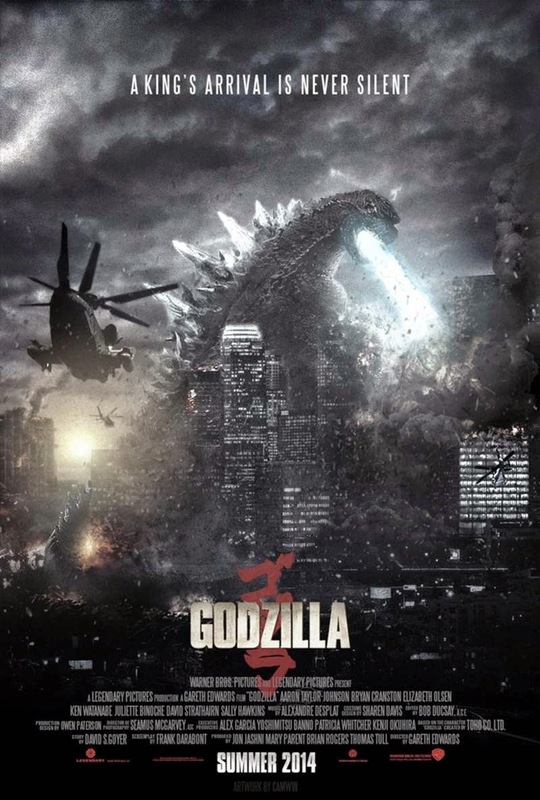 For all of the acclaim that Bryan Cranston has received as an actor, he is not going to get prominent billing next to Godzilla. 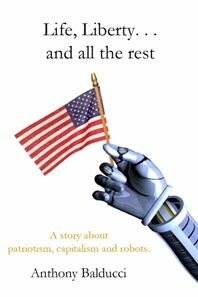 Compare this to promotion for an older film, The Patriot (2000). 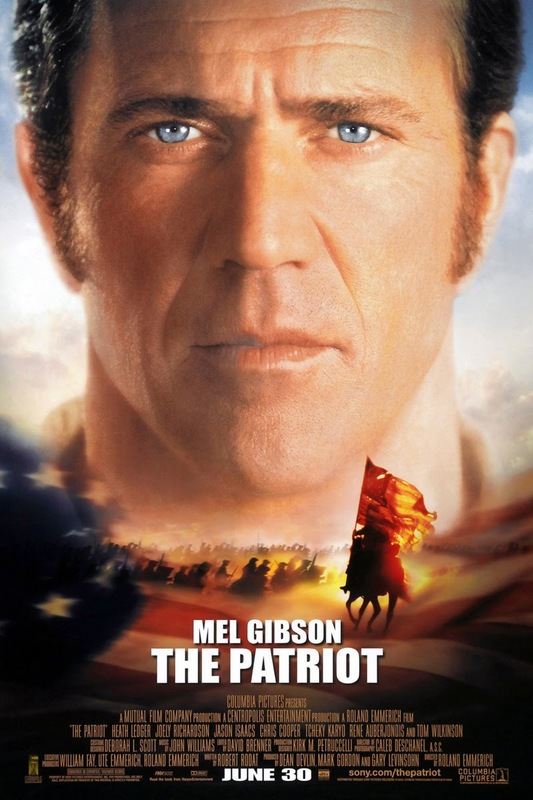 Although the film depicted epic, real-life battles of the American Revolutionary War, it was the name and likeness of star Mel Gibson that dominated the poster. 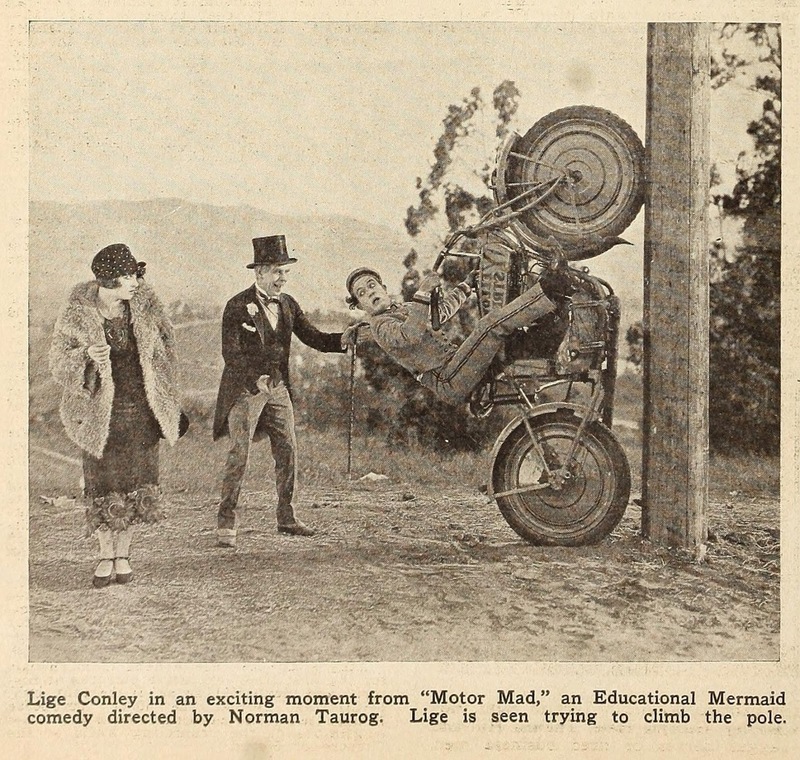 In my perusal of Moving Picture World, I became interested in the summaries of three Linder comedies. The stories were not the sort found in Linder's most celebrated work. The comedian, who was at his best playing a dapper boulevardier, is miscast as a workman in one film. In the other two films, the comedy sometimes depends more on camera tricks than on the clever actor himself. The most appropriate vehicle is Tormented by his Mother-in-law, which finds Linder obsessing over domestic woes. Understandably, Linder was still refining his style of comedy at the time. The action in these films, as described, was nonetheless amusing. Let us now go through complete summaries of the action. Max looks forward to a carefree flight in a balloon. Unfortunately, he fails to pull the grapnel into the basket. The grapnel, which drags along beneath the balloon, catches onto a police officer's coat, carries the officer into the air, and eventually dumps him into a canal. It then tears off the roof of a building, panicking the building's occupants. But this is just the beginning of the havoc. The grapnel latches onto a newspaper kiosk, then a doghouse, then a baby carriage. One by one, the items and their respective occupants are dropped to the ground. The people below are frightened when the kiosk and the doghouse suddenly drop out of the sky and burst into pieces. Eventually, the balloon becomes deflated and gets caught in a treetop. An angry mob awaits Max as he climbs out of the tree. This is the type of mass destruction comedy that would become a specialty of André Deed and Marcel Perez. Perez in fact reworked the plot of A Glorious Start twice - first in 1910 with Tweedledum's Aeronautical Adventure (released in France as Robinet appassionato pel dirigibile) and then in 1911 with Tweedledum, Aviator (released in France as Robinet aviatore). A print of A Glorious Start (under its original French title Les débuts d'un aéronaute) is being held in the Lobster Films archive. I also came across a few non-Linder curios that were produced during the 1909-1916 period. A lord orders his wife to be beheaded for dancing with the peasants. The clever wife uses a dummy's head to fake her execution. This European comedy, distributed in the United States by the Chicago Film Exchange, is somewhat gruesome. At a farm house, a starving tramp removes a boiling chicken from a soup pot and replaces it with the farmer's pet cat. The farm hands realize that something is amiss as soon as they taste the bitter soup. The men finally expose the tramp's deception when they reach inside the pot and pull out the bedraggled corpse of the cat. A group of boys hurl a barrage of snowballs at a homely, long-haired violinist. The snowball fight quickly escalates. The film ends with the violinist being rolled inside a huge snowball to the front door of his home. A drunk man gets tangled up in his bed sheets and, while trying to free himself, he falls down a flight of stairs and tumbles out into the street. It isn't long before the ghostly appearance of the shrouded man is terrifying passersby and causing a widespread panic in the neighborhood. A man moves into an apartment which the owner has advertised as quiet, but his neighbors' quarreling and playing of musical instruments create a sufficient din to drive the new tenant from his rooms. A newlywed couple is preparing for their honeymoon night when the groom's best man enlists the aid of other wedding guests to play pranks on the blissful pair. 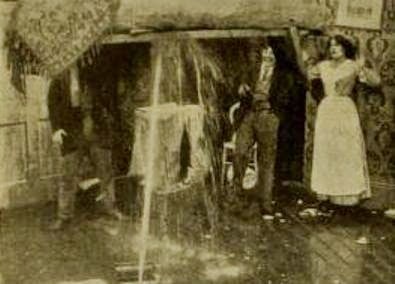 The guests find it amusing to throw cabbage down the chimney and stick a hose into the window to spray cold water at the couple. A plumber and his assistant manage through their clumsy efforts to flood a family's home. The highlight of the film occurs when the plumber cracks the water main under the floor. He attempts to plug the spurting leak by moving a bed on top of it, but the jet is so powerful that it lifts the bed high into the air. From what I could determine, this film initiated a longstanding trend of comic plumbers demolishing homes. 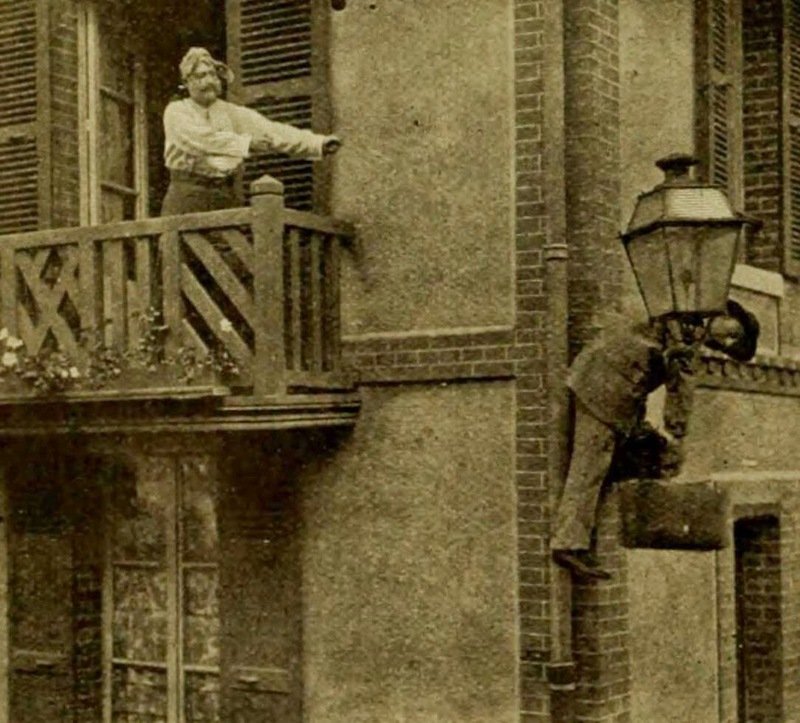 Similar comedies, including A Fair Exchange (1910, Essanay) and The Plumber (1911, Selig), followed soon after. Tom (William Wadsworth) comes up with a gimmick to meet Alice (Cora Williams), a pretty female doctor. He attaches a dummy's arm to his shoulder so that he can pretend that his arm has been broken and needs to be set. A similar routine turns up in Jewish Prudence (1927), in which Johnny Fox uses a fake leg to make insurance investigators believe that his leg was paralyzed in a trolley car accident. Funnicus and Tortillard watch through a window as a maid inside prepares a hearty meal. Funnicus figures to frighten away the maid so that they can steal the meal for themselves. The two men rob a pair of balloons from a toy merchant and draw grotesque faces on them. Then, they deftly fasten the balloons to their collars and tuck their heads under their coats. As expected, the maid is alarmed to see these strange balloon-head beings and runs to find the police. Before the maid can return, the pair make off with the coveted meal. The film was originally released in France under the title Gavroche forte tête. 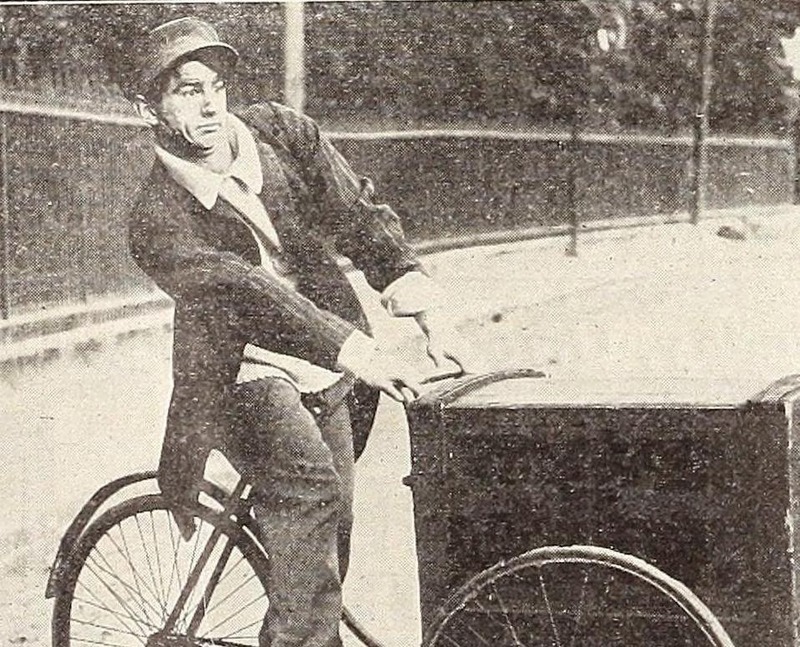 The film's star, Paul Bertho, was featured in many comedies for Lux and Éclair from 1911 to 1914. Softy is knocked unconscious when a box falls out of an upper window and hits him in the head. Softy finds when he regains consciousness that he cannot resist spinning around in circles. An eminent surgeon opens Softy's injured cranium and extracts a spinning top that entered his skull when the box struck. The surgery ends successfully, restoring Softy to his normal state. A blood transfusion from a burglar transforms a purity league chairman (George Robey) into a rake. You can read more about Monsieur Linder and early film comedy in my book, Eighteen Comedians of Silent Film. Here are a few photos that I found in The Moving Picture World. 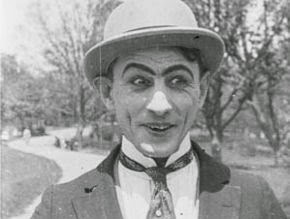 This is a photo of Augustus Carney, who was leading film comedian from 1910 to 1914. 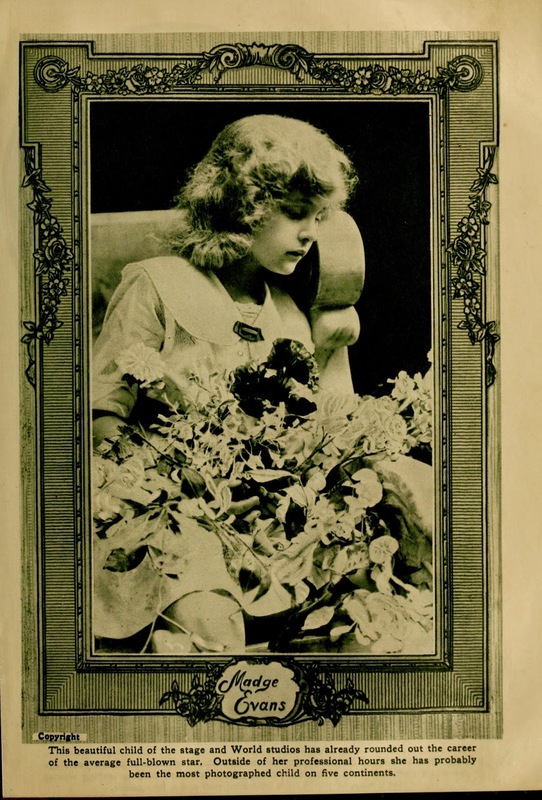 Madge Evans was a busy child actress in the silent era. 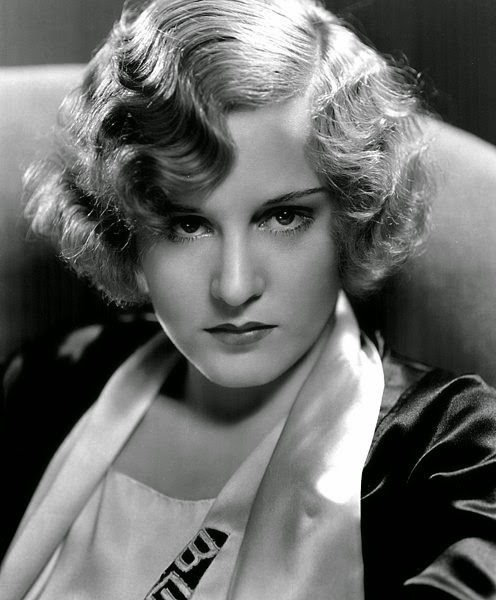 In the 1930s, the actress had no problem transitioning into adult roles at Metro-Goldwyn-Mayer. She co-starred opposite several popular leading men, including Spencer Tracy, Jimmy Cagney and Clark Gable. 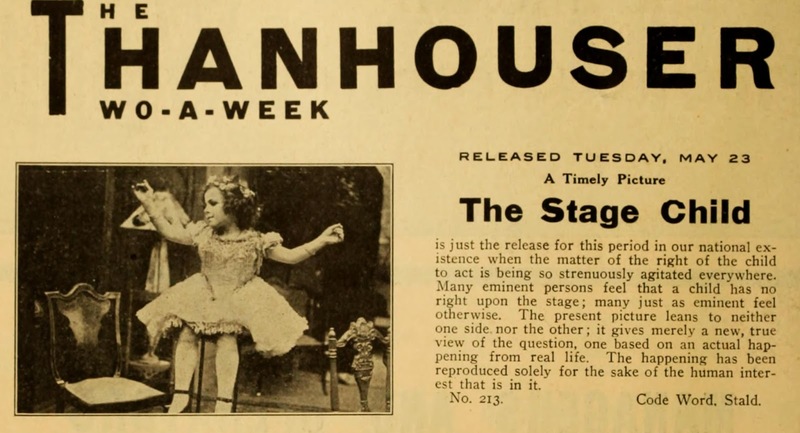 This ad for The Stage Child (1911, Thanhouser) is proof that the controversy of child actors goes back more than a hundred years. Lige Conley's antics got more than their fair share of attention from the press. This is Chaplin imitator Ray Hughes in In and Out (1918). I have no idea where this production still came from. Ethel and Albert was a television series about an amiable married couple, Ethel and Albert Arbuckle, who lived in the small town of Sandy Harbor. Radio historian Gerald Nachman called the show "insightful and realistic," but it could also be silly at times. This was the case in an episode that aired on October 31, 1953. Albert (Alan Bunce) sticks a pumpkin over his head as a Halloween prank, but the joke ceases to be funny when Albert finds that he is unable to remove the pumpkin. 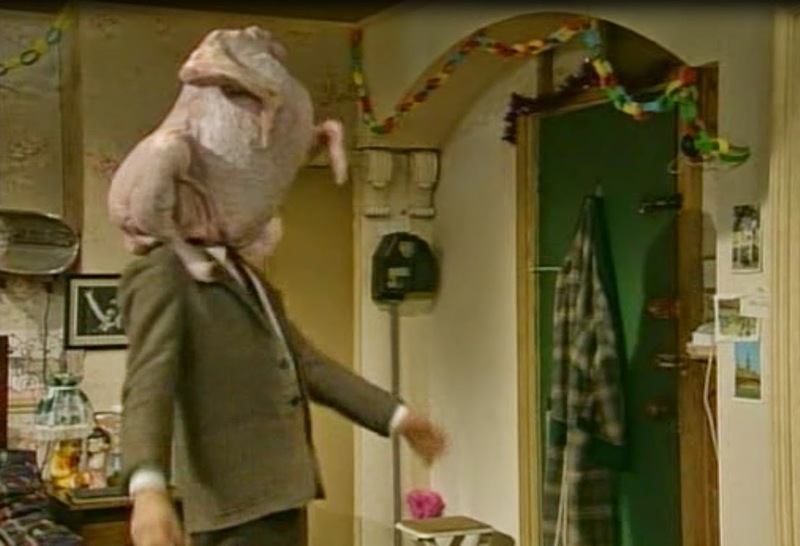 The strange and inept Mr. Bean (Rowan Atkinson) gets a holiday turkey stuck on his head in a 1992 Christmas special titled "Merry Christmas, Mr. Bean." In an episode of The Middle ("Get Your Business Done," 2012), Patricia Heaton gets her arm stuck in a blood pressure machine. 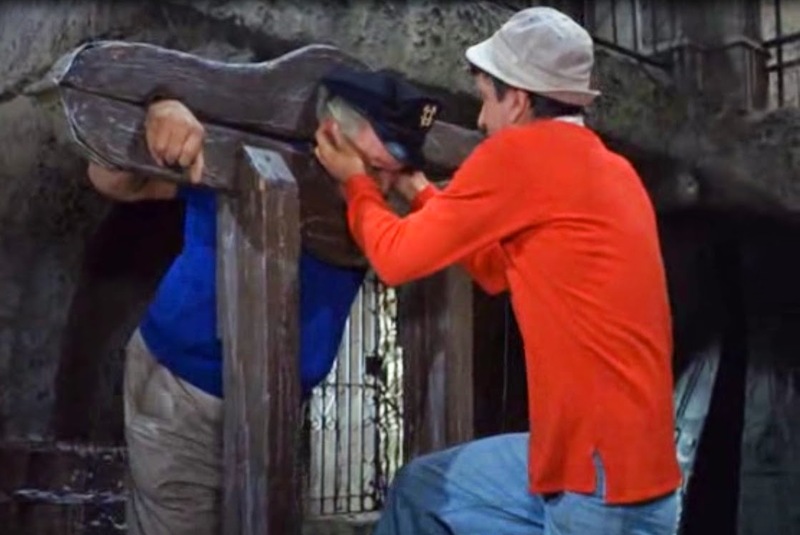 A 1966 Gilligan's Island episode, "The Friendly Physician," features the Skipper (Alan Hale, Jr.) getting stuck in stockades. Here is the full clip for those who haven't received their fill of madcap humor from the screencaps. The handcuffs routine, which I discussed at length in a previous article, is a subgenre of the "stuck" routine. I have come across two more examples of the handcuffs routine. Louise Fazenda and Clyde Cook accidentally become handcuffed together in A Sailor's Sweetheart (1927). The actors, who play respectively an old maid teacher and an old sailor, are an unlikely pair, but it creates further disharmony when Fazenda consumes too much alcohol and loses her inhibitions. The sailor becomes desperate to cut himself loose from his increasingly unruly companion. 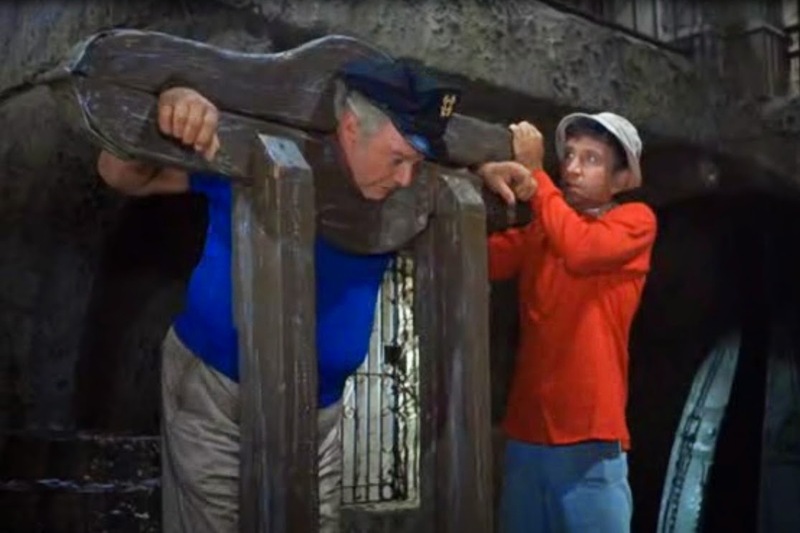 The Three Stooges' version of the handcuff routine was recreated in The Hangover (2009). I have come to the conclusion that a comedian tossing around a faux baby is a British thing. I wrote about this subject twice before. Click here and here for those articles. An unidentified British comedy film was described in the 1938 National Film Library Catalogue as follows: "A mischievous newsboy changes the babies in two prams outside a shop. A man comes out and wheels one pram away. A woman comes out to the other, discovers her loss, and chases the man. A policeman joins in the chase. The man is momentarily caught and in the altercation which follows. The policeman finds himself left with the baby. He throws it over a wall, but it bounces back into his arms." This is similar to a sketch from the BBC comedy show Harry Hill's Fruit Fancies (1994). 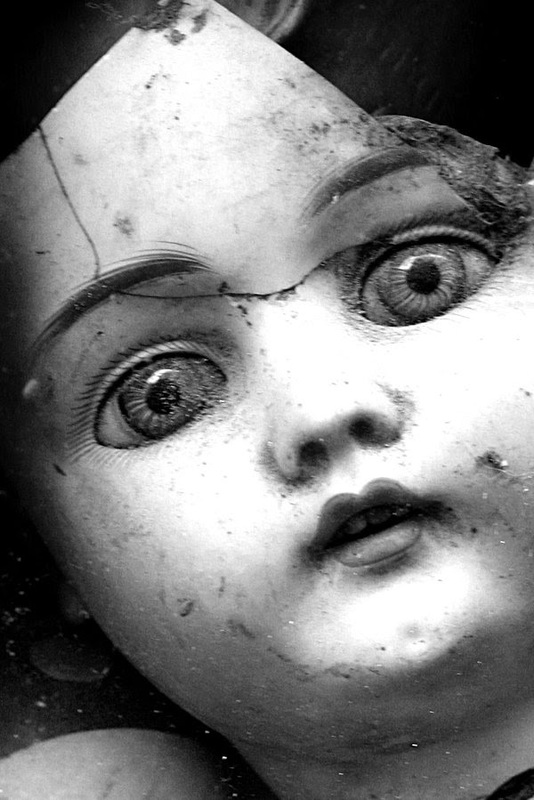 A particularly outrageous example of baby doll abuse occurred in a sketch from another BBC series, The Big Train (1998). 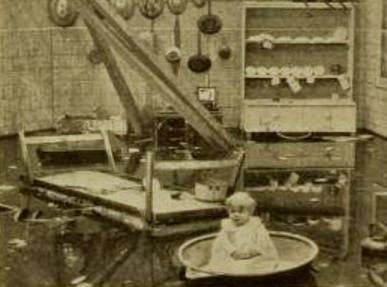 This scene from Ernst Lubitsch's The Oyster Princess (1919) is similar to the famous baby doll scene from I Love Lucy ("Pregnant Women are Unpredictable," 1952). 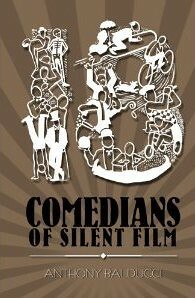 I wrote in Eighteen Comedians of Silent Film about a 1915 Pathé Frères comedy, Max's Double (released originally in France as Le Sosie). 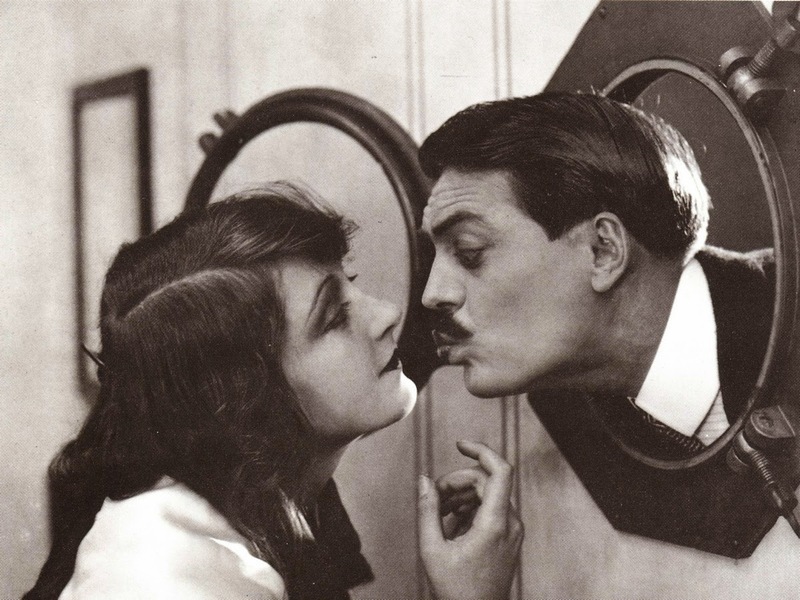 The film involves Max Linder struggling to outdo a lookalike who is trying to take over his life. A Bioscope critic thought that the plot was so chilling that it was justified to describe the film as "a dramatic farce." It is not surprising that the doppelganger usurper has gone through a dark and disturbing history in the horror genre (See 1913's The Student of Prague or 1970's The Man Who Haunted Himself). But the slyly funny elements of Max's Double can be traced decades earlier to Fyodor Dostoyevsky's 1846 novella The Double. 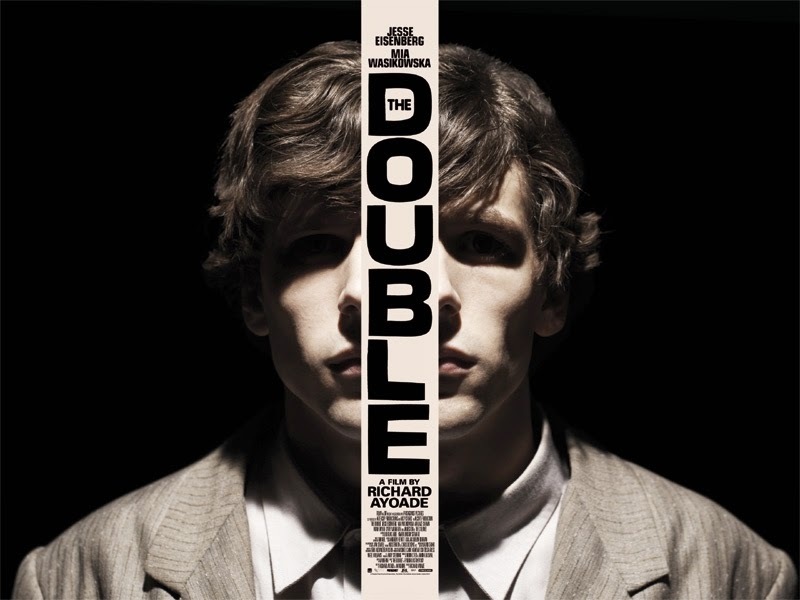 A new film adaptation of The Double, which was directed by comedian Richard Ayoade, was recently released on DVD. 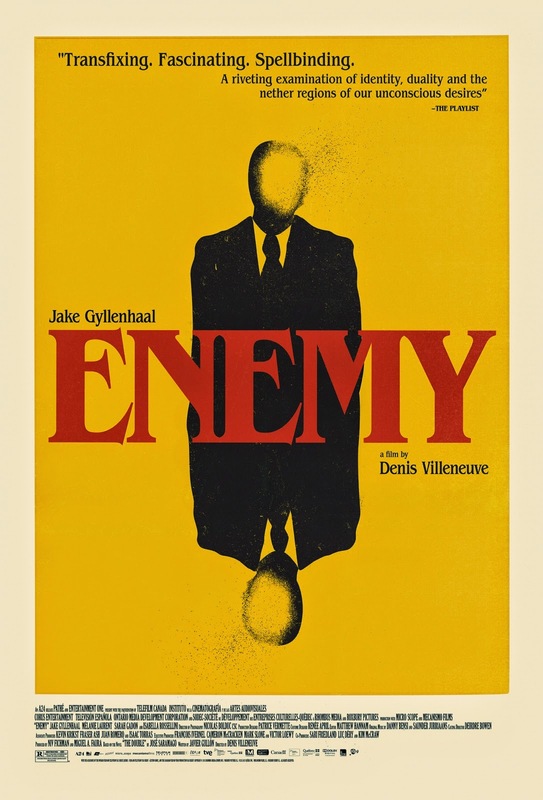 The plot of Enemy (2014) also includes elements of The Double. The Man Who Haunted Himself was adapted from a 1957 novel by Anthony Armstrong. 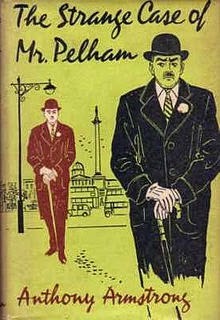 "The Strange Case of Mr Pelham" was made into an episode of Alfred Hitchcock Presents that originally aired December 4, 1955. 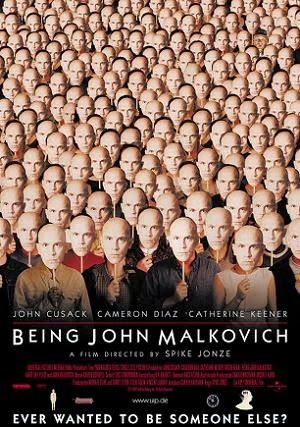 Fans of The Playhouse (1921) and Being John Malkovich (1999) should also be interested to know that the idea of a man being plagued by multiple clones is something that also turned up in The Double. The book's protagonist, Yakov Petrovich Golyadkin, is finally pushed over the edge when further doubles show up at a party. Dostoyevsky wrote, "[I]t seemed to him that an infinite multitude, an unending series of precisely similar Golyadkins were noisily bursting in at every door of the room. . ."
A bit of housekeeping is necessary today. I have added brief footnotes to four previous articles.